General purpose AWG for frequencies less than 1 MHz. Designed for keypad (local) or GPIB & RS-232C (remote) operation. A very high-fidelity arbitrary waveform genrator, the 2411A/2411B feature .005% distortion with 16-bit vertical resolution. THD plus noise is typically less than -86 dB. High resolution and low idistortion make this an excellent choice for precise applications. 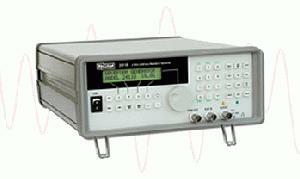 The 2411A/2411B uses optional WaveWorks Pro+ waveform creation software to build standard, transfer function, or math operations-based waveforms. RS-232C interface comes standard with each unit. GPIB interface and 1,000-step sequence generator are available, along with a wide variety of other options and accessories.